This is why WordUp: Long Island LitFest has been bringing authors to the region since 2015, with a full-day literary festival taking place each spring. Best-selling authors-Meg Wolitzer among them this past April-came together in one pace, each taking a turn at the microphone. Then, the audience had their books signed and got to mingle with their favorites. 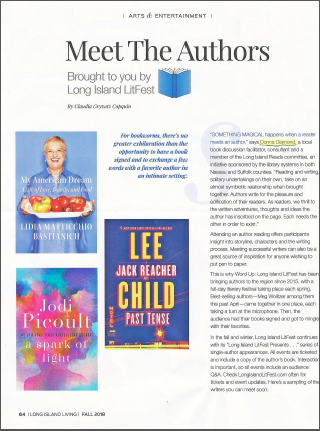 In the fall and winter, Long Island LitFest continues with its "Long Island LitFest Presents…"series of single-author appearances. All events are ticketed and include a copy of the author's book. Interaction is important, so all events include an audience Q&A. Check LonglslandLitfest.com often for tickets and event updates.